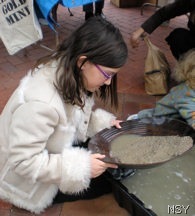 Communities throughout Colorado plan festivities and special events to celebrate the sesquicentennial of the Colorado gold rush. With the slogan, “Pikes Peak or Bust!” thousands of prospectors headed to the hills of the Kansas Territory to strike it rich. Central City had a population of 60,000 by 1860. Golden, Denver and Boulder were fast becoming major supply and transportation points. The rapid growth led to the creation of the Colorado Territory in 1861 and statehood in 1876. One of the 2009 kick-off events was held in Denver Saturday, May 2 at the Governor’s Residence as part of the First Saturday: Free Family Day series. Gilpin County, Blackhawk, Central City, Golden, Idaho Springs, the Molly Brown House Museum and the Clear Creek County Metal Mining Association entertained and shared plans for continuing celebrations. Clear Creek Railroading & Mining Days is scheduled for May 23-24 in Georgetown. Golden plans a huge party June 12 beginning at 6:30pm including a parade, music and laser light show. Summertime events in Gilpin County range from Mountain Man and Mining Weekends to High Tea and a Cemetery Crawl. The 4th of July will see Boulder celebrating at numerous venues. What better place to gain a perspective than the National Mining Hall of Fame & Museum in Leadville? “All That Gold Can Buy” Denver’s Mineral Millionaires exhibit at the Molly Brown House Museum – May 19 – October 4. Breckenridge has designated August 8-9 as the Breck150 Grand Celebration. Beginning the day will be the extraction and opening of the time capsule placed in the cornerstone of the Summit County Courthouse on July 31, 1909. Music, kid’s events, interactive activities fill the day until the grand finale fireworks display. Visitors to businesses in Idaho Springs have an opportunity to win real gold in the months of June and October. 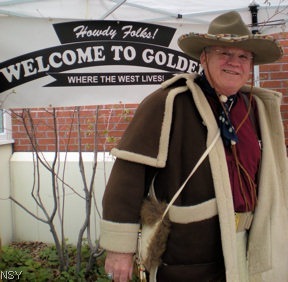 Choose an event or follow The Colorado Gold Trail to join in the Gold Rush celebrations.